Pallets are the strongest and creative things to recycle because you can use them to create cheap furniture. You can decorate your garden by designing a beautiful patio garden set with the help of pallet wood. 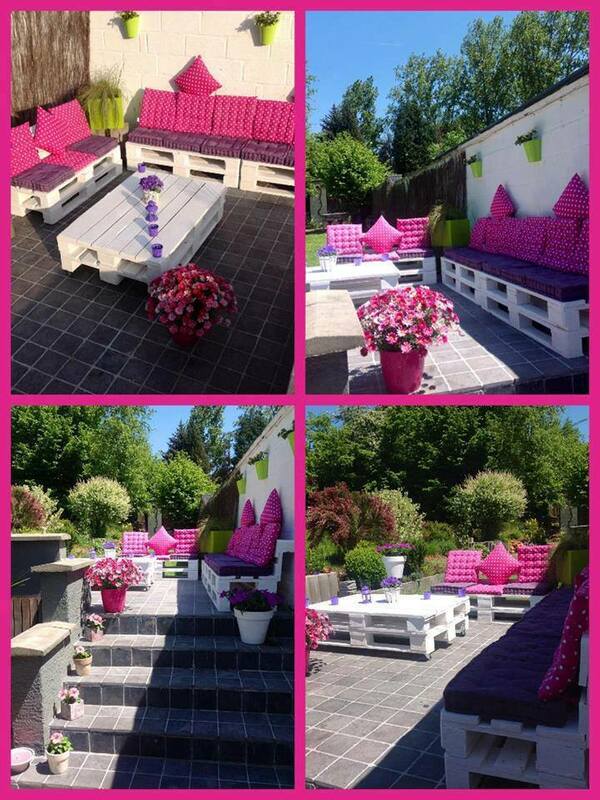 Look at the following pictures; there you can see a pallet patio set in the garden. Pallet wood is used to design tables and benches to provide a creative sitting arrangement in the garden. You will get a great chance to spend some time near nature with your friends and family members in the summer evenings. You may get pallets stored at your own house to design the patio garden set. There is nothing to do more, just sand pallets, ripped them up and resize them to design outdoor benches for lawns and garden spaces. You can also design a coffee table for your garden because it is an important part of the patio garden set. You can design a footstool as well to increase your comfort and get additional sitting space in the garden. The pallet garden furniture is easy to handle because you can move them from one place to another by pushing or dragging. Select a complimenting color to paint and matte finish the patio garden set to add stability to it. It will be a cheap, but an attractive arrangement for your garden because the patio garden set available in the market is really expensive. It can disturb your budget; therefore, you should consider pallets patio garden set because pallet wood is easily available. You can decorate your garden in the similar way as shown in the images or add your own creativity. With your creative skills, you can make this corner really attractive and comfortable to spend a good amount of time near nature.